The drape kits give your projection set-up a professional look and hide background equipment (typically for rear-projection) behind the curtain, keeping the audience focused on your projection content. 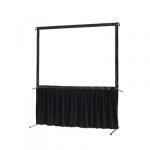 The drape kits are available in 2 different versions - a single skirt for just the bottom of the screen, or a complete surround for all 4 sides. The drapes are black velour-coated, completely opaque and absorb ambient light reliably. 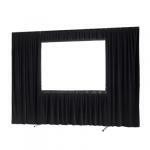 Give your celexon Folding Frame screen the professional finished look with the new drape kits!